Do Outbound Links Contribute to Page Authority? You’re a SaaS company, and you’re interested in how content can help you get more sales, earn a higher customer retention rate, and possible improve your overall brand reputation in the process. You’ve heard about content marketing, but you might not know what it takes to build an actual strategy. More importantly, you aren’t sure what other, similar SaaS companies are doing, or what’s expected from you from a baseline content perspective. An introduction, to follow, discussing the general advantages and goals of a SaaS-originated content strategy. A guide on content marketing for non-branded topics and an audience specific to your niche. A guide on help documents and troubleshooting for your current and prospective users. A section on growth and ongoing development to keep your strategy thriving for the long term. With that covered, let’s take a look at two major considerations for your content strategy. I’ll dig a little deeper into the benefits and specific tactics to use in each respective section to follow, but to start, it’s important to grasp these principles. Staying ahead of your competition means being more visible, being more trusted, being more valuable, and encouraging greater loyalty. If your content marketing strategy is, on the whole, better than your competitors’, you’ll have no trouble achieving all of these. Accordingly, it takes time to develop, but once you’ve established some early momentum, you’ll see a rising rate return for as long as you continue managing your campaign. Ongoing content, or content marketing, will refer to blog posts, articles, whitepapers, eBooks, infographics, and other forms of content that you’ll be publishing onsite and offsite for your users. This will be targeted to both unfamiliar prospective users and current subscribers, and its main purpose will be to provide practical information. FAQ and troubleshooting content will focus on addressing the needs of your current user base in a number of different forms. Its main purpose will be to improve customer understanding of your app and increase customer retention and loyalty. There are many types of content you can use as part of an ongoing content marketing campaign, so I won’t go to the trouble of listing them. There also aren’t many rules for where you host this content; an onsite blog is a good spot, but don’t neglect offsite opportunities. Remember, your goal here is to outcompete your fellow service offerers, so it’s all about offering something your competitors can’t or won’t. In this section, I’ll go over the principal benefits of ongoing content marketing, keys to success, angles to direct your strategy, and how to get started. These are just some of the benefits you’ll receive—many of which are amplified if you’re able to produce and syndicate content better than the competition. Visibility opportunities and brand awareness. Have you ever heard of Hubspot? Of course you have. Do you know why? Because they have an awesome ongoing content marketing strategy. When you create and distribute great content that people want to read, they’ll naturally happen upon it (by browsing their favorite sites, searching with a relevant query, getting it from a friend, or finding it on social media). Soon, they’ll start noticing your name attached to the work, and your brand visibility will begin to grow. Inbound traffic. Ongoing content is a channel to increase inbound traffic, and from multiple directions. Writing good content targeted toward search user interests, consistently, helps you rise in search ranks, which increases your organic traffic. Syndicating on social media will increase your social traffic. Plus, posting on external sites will boost your referral traffic. Best of all, these effects tend to amplify over time. Brand reputation value. This is especially important in a competitive environment. When you write good content—better content than a user’s ever seen before—you’ll be perceived as the thought leader in the industry. Your reputation as an expert authority will increase, and you’ll earn better conversions and higher customer loyalty as a result. Competitive differentiation. It’s hard to stand out in the SaaS world, especially if your model is similar to another company’s. Content gives you the opportunity to differentiate yourself. Take a look at Kroll’s unique content offerings, which include events and webinars to attend in addition to basic content—you can even submit your own. Conversions and new subscriptions. Content also gives you a platform to pitch the value of your product (though your primary focus should be on providing valuable information). 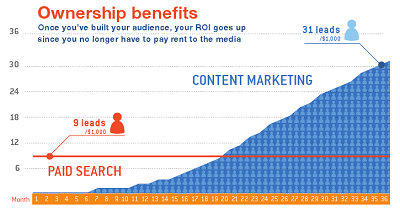 If executed properly, content can earn you more conversions and subscriptions directly. Clearly, an ongoing content strategy is a good thing. But you also know that simply having a “good” strategy isn’t enough. Your strategy needs to be better than that of your competition, so what components are going to help you get there? Appropriate targeting. Don’t write for everybody or you’ll end up writing for nobody. It’s tempting to write to a “general” audience for the extra volume, but it’s far better to have a smaller audience who’s hungry for your content than a large one who’s lukewarm. Know which demographics matter, and write to them. Originality. This should go without saying, but your content must be original! Don’t just find a SaaS competitor with a service similar to yours and copy everything they’re doing on their blog. Find a unique angle and go with it. Make yourself stand out. Detail. The level of detail you provide is crucial to proving you’re worth your salt—and when I say detail, I don’t mean length. I mean nuggets of specific information your users wouldn’t be able to find anywhere else, such as case studies, examples, statistics, and hard facts. Dig deep here. Practicality. The content that gets shared the most tends to be useful in some way. For example, it might help people be more efficient, or give them a new idea to try in their chosen careers. Again, write to a specific target audience here. Diversity. Don’t write variations of the same topic over and over, and while it’s a good idea to retain some consistently, it’s a bad idea to use the same formulas and formats too often. Diversify your strategy by adding in new mediums, such as infographics or video, and experimenting with new topics regularly. Syndication and visibility. Even if your content is amazing, people won’t be able to find it on their own. Work to syndicate your content and make it visible to people outside your current readership on social media and other online outlets. Propagation. It’s also a good idea to set up separate pillars of your content strategy, such as by building relationships with different publishers. This will also help you earn more high-quality inbound links, with a more diverse backlink profile. Escalation. All these components in place may seem like enough—and yes, if you follow these, you’ll likely start getting the edge on your competition within months or even weeks. However, you can’t let your strategy remain stagnant. Your competitors will be breathing down your neck, and that means you’ll have to escalate your efforts, iteratively, to see better results over time. The general rules I outlined above apply to everyone, but they don’t give you much direction when it comes to topic selection or angles to choose for your content. Unfortunately, I can’t give you much specific advice here unless I knew exactly what type of service your company offers and who your target audience is. Lists. You’ve seen listicles everywhere, and for good reason; they’re digestible and appealing. How-tos. Help people do what they need to have done. Futurism. Make bold predictions about the future of your industry (or technology). Resources and cheat sheets. Give your users long, downloadable guides to use in their professional environments. Infographics. Infographics have massive share potential thanks to their attention-grabbing nature. Videos. Videos are only getting more popular—consider video webinars here too. Quizzes. This may be hard for SaaS companies to adopt, but try to find an application for your specific software. Opinion pieces. State-of-the-industry pieces and bold, controversial stances can be powerful. Don’t take this list as the be-all, end-all; instead, use it as inspiration in combination with your audience knowledge and topic selection to come up with all-star post ideas. If you want to beat your competition, you have to know what they’re doing in the first place, so get researching! Everything starts with strategy, and you won’t be able to form one until you know where you currently stand. Once you’ve gathered the data on your competitors’ ongoing content strategies, you can use this entire section to hunt for weaknesses. What are they doing that they shouldn’t be doing? What aren’t they doing that they should? This information should provide the foundation for your strategy, and once you start following it, readers will naturally be more attracted to your brand’s work over any other competitor. Of course, content for SaaS companies isn’t and shouldn’t be limited to only traditional content marketing. Generally, content marketing is designed to attract new customers—but how can you use content to make sure they stick around? Customer retention is crucial if you want your SaaS to keep growing, and one of the best ways to up your rates is by providing a free, comprehensive body of content to answer common user questions, troubleshoot problems, and generally keep your users informed of your software’s latest updates. Improved customer retention. I mentioned this in the introduction, but customer retention is a need you can’t ignore in a competitive setting. Losing a customer is bad enough, but think about the effects of a customer transitioning to one of your competitors—you’ll lose traction, they’ll gain traction, and the word-of-mouth ripple effect could cause even more users to go. You have to fight to keep your users, so make sure your help and resources are better than anyone else’s. Prospect reassurance. Your FAQ section, if publicly available, can also serve as a way to reassure possible prospects that your company is the right choice. Seeing a full resource library will demonstrate your commitment to customer service, and could help you close an otherwise iffy deal. Reduced customer service costs. Think about it this way—if your content library was so comprehensive that it answered every possible customer question, you wouldn’t need a customer service team at all! Though not a competitive advantage, there are cost efficiency benefits to adopting this type of content strategy. Greater customer ownership. Depending on what elements you offer, you could encourage a greater sense of ownership and participation among your users. For example, a community forum could bring your users together, establishing greater brand loyalty and even brand evangelism. Circular feedback. Finally, with improved customer participation and small additions like “was this article helpful?” style micro-surveys, you’ll glean new insights from your customer base, which can lead you to even better improvements of your brand and software. Think of it as a glorified customer survey that requires no additional investment. Just like with ongoing content, there are certain components you’ll need to include if your strategy’s going to be successful. These tenets apply no matter what type of content you’re pursuing—an FAQ page, an encyclopedic-style library, a customer forum, or some other type. Specificity. Your content shouldn’t speak in general terms. When your customers arrive, they’re either dealing with a specific problem or they have a specific question—your content needs to address this specifically. Otherwise, your guidance will be unhelpful, and your customers may seek a more knowledgeable competitor as an alternative. Timeliness. This is especially important when you address a new update, a new change, or something that went wrong in your app. You have to be proactive in your offerings, so that when users start looking for something, it’s already there waiting for them. Your help documents aren’t something you can procrastinate on—get them up and running as soon as possible, and be proactive when it comes to addressing new features. Visual and/or audio elements. Not everyone learns the same way, so it’s imperative that you don’t rely on any one format or medium to comprise the bulk of your resources. Written articles are great because they’re relatively easy to produce and they can be indexed completely in search engines, but video and audio elements are also helpful—even the inclusion of screenshots can take your documents to the next level of quality. Customer engagement. No matter what forms of help you choose to offer, there should be some way for customers to engage. In a forum, this means hosting an open community that can ask and answer its own questions. In a tutorial series, this might include micro-surveys to gather feedback. Even a simple thumbs-up/thumbs-down can make customers feel more engaged and give you more feedback with which to improve your approach. Ongoing improvement. Speaking of improvements, you should always be making them. Your help and resources section will never be complete, and it will never be “good enough.” To stay ahead of the competition, you need to constantly work to add new content, update old content, and refine your tactics to provide the best material possible for your audience. Problem resolution. First and foremost, your content should be able to—theoretically—solve any customer problem on its own. If your content is unhelpful for any reason, you need to have contingencies in place, such as a chat feature or a customer service line. Curiosity exploration. Next, remember that prospective users will be crawling your help guide to get a feel for what your software is like. Accordingly, much of your content should “show off” the best features of your product, and make it look as simple and appealing as possible to an outside user. Customer commitment. Show that you truly are committed to your customers by listening to them. If you have forums, get involved yourself. If you see lots of the same question or complaint, prioritize it as an item for the next round of publication. This will show prospective customers how valuable you are (and will increase loyalty in your existing user pool). The goal here is to be as specific and comprehensive as possible, but you don’t have to do everything all at once. Don’t put that level of pressure on yourself. Instead, start with the basics; a simple how-to guide or tutorial can work well as an introductory measure. Walk through your software as a new user, and document the process. Think up a handful of common questions a user might have, and address them on a simple FAQ page. From there, you can expand outward. Start digging into more specific problems a user might run into, and gather data about what your customers might like to see. Your resource library here will be a continuous work in progress, so the sooner you get started, the sooner you can reap the benefits. Keep what works. If you find a particular type of article or feature is popular, try to learn what qualities made it that way, and replicate them in future additions. Rely on objective data here, rather than your own assumptions. Throw away what doesn’t. Sometimes, a content idea seems great in theory, but when it’s published and live, it just doesn’t generate any meaningful momentum. Don’t force the jigsaw puzzle piece into place; instead, recognize that it isn’t working, and move onto something else. Listen to user feedback. If you know what questions to ask and how to get your users to participate, they’ll tell you everything they want and everything they need. All you have to do is listen, and give it to them. Be better. There are always ways to improve the quality of your content—more detail, more images, more coherent organization, etc. The minute you stop improving, your competitors will start catching up, so always strive to be better. Do more. Expand horizontally by offering new regular features, new systems, and new areas of development. You don’t have to keep everything (and you shouldn’t keep applications that aren’t working), but you should always be building new wings of your portfolio. One-up your competitors. Your competitors are sneaky, wily, and unpredictable. If they’ve managed to compete with you this long, it’s because they’re smart and they aren’t afraid to tackle challenges. They’re going to keep coming out with new, innovative content strategies, so keep an eye on them—and work to find ways to one-up them with your own. Content is more than just a marketing tool, and it’s more than just an ingredient in your overall brand strategy. If wielded properly, content is the ultimate weapon you have to edge out the competition. With a better ongoing content strategy, you’ll be more visible, more authoritative, and more helpful than any of your competitor, and as a result, you’ll wind up with a far higher customer acquisition rate. Similarly, if your troubleshooting and “help” content strategy is better than your competitors, your customer retention will prevent your users from ever switching sides. SaaS is a crowded, competitive field with lots of turnover, lots of risks, and enormous potential rates of return. You may have a great product, but there are likely dozens of competitors with similarly great products. You owe it to yourself to find alternative routes to differentiation and, of course, improvement to set yourself apart from the crowd. Content is the perfect place to start.